“Braunston Bangers” Old boats and cars?…… Actually the title refers to the delicious sausages purchased from Braunston Butcher’s. But I’m getting ahead of myself. 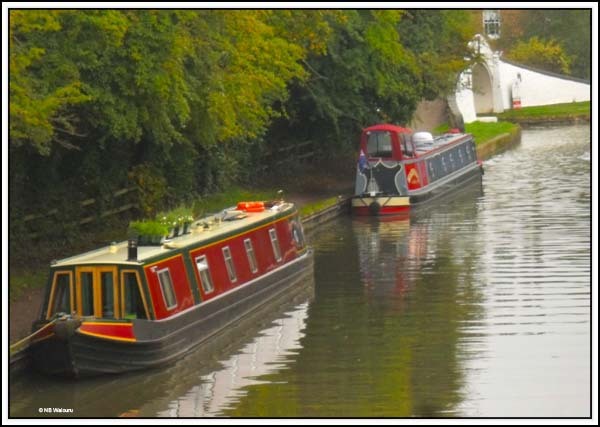 We quietly cruised into Braunston on tick-over passing the CRT services block with the moored boat protruding into the middle of the canal and then on past the “swindlers” before ‘spotting’ a couple of vacant moorings. Seeing no one was on the move we decided to head further towards the bottom lock and wind before mooring. I did a really good turn into the second marina entrance to wind Waiouru and then Jan told me “There’s are sign saying ‘No Winding’ here!” Too bloody late…. I’m committed. The manoeuvre was achieved all very gently as a 3 point turn…. A far cry from my first 16 point effort. However as I completed the movement a boat appeared and grabbed the mooring we’d intended to use. Not to worry; we moored back near the other entrance into Braunston Marina. Jan produced the leash and said “walkies” to me and we were off backtracking to the “swindlers”. Gosh there are some interesting smells on the towpath at this time of year! After wandering around the aisles in Midland Chandlers we departed empty handed. Actually many of their shelves looked rather depleted. Perhaps as a consequence of the recent “Freaky Friday” sale? We were after three items and they had none in stock. Jan dragged me up the hill to the small supermarket to check they did stock her weekly magazines (they did, but delivery isn’t until tomorrow). The supermarket is also the local post office and I happened to notice this particular object outside. I’m trying to recall if I ever saw one in NZ and am sure they are not found in Australia. 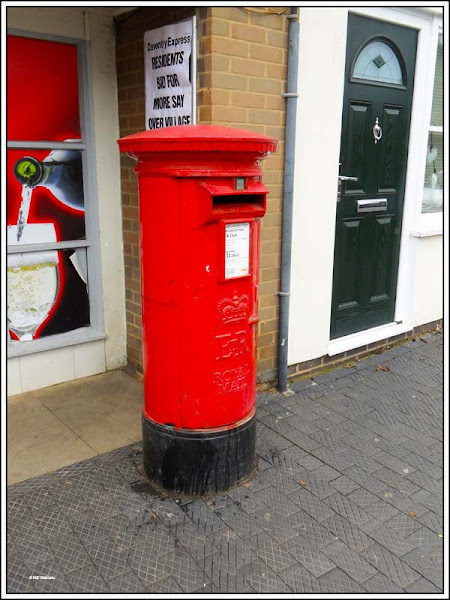 Of course they have public post boxes, but nothing this sophisticated! Then we crossed the road to the butchers where we window shopped and smelt the produce before Jan relented purchasing a dozen of their locally made sausages. The footpath took us back to Waiouru via the bottom lock. We wandered into the chandlery below the lock and discovered they actually had one item we wanted. We’ve been searching for these items for months and finally found them. I’d originally tried using ‘Tiger Clips’ but they were unsatisfactory. These clips are exactly what we were wanting and I fitted them on our return to Waiouru. 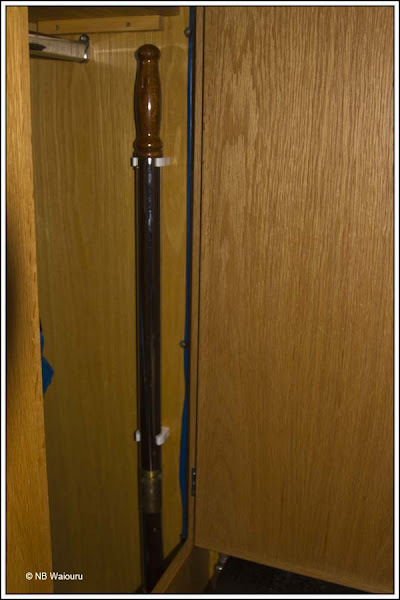 The tiller arm can now be securely stowed in the wet locker when not required. 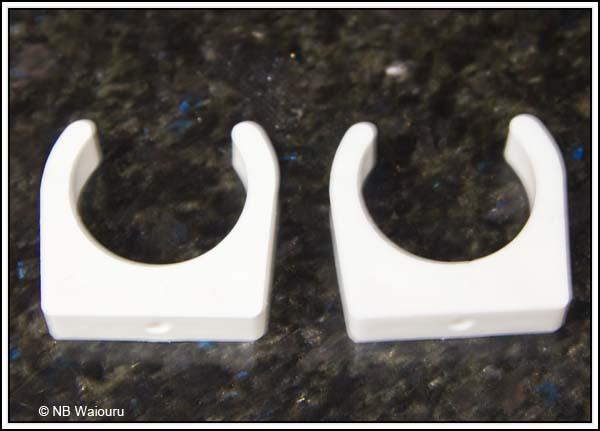 The chandlery was also able to order the exterior door stops we want for the rear cabin doors at a very reasonable price. They should arrive tomorrow. There is a small canalside shop adjacent to the bottom lock. Jan has previously purchased some canal porcelain plates there on a previous visit to the UK. This time she was able to find another canal boat cross-stitch pattern that will eventually adorn the saloon wall. By the time we made it back to Waiouru the weather was closing in. Not that it worries us. The heater is on and we’re not going anywhere……. for the moment! Enjoy those bangers - they're great! Glad you found the 'cross stitch shop' Jan. I forgot to remind you to take a look on my last comment. I got a couple of lovely miniatures in the sillouettes range. They have a Lowry look about them and are in colours that resemble a sepia finish. Having to be patient to get started on them - must finish my current one first! I know you will understand :-). The link should take you to an old posting box that as far as I am aware is still in Wellington. I think that it is in Post Office Square outside Clarie Gibbons book shop.